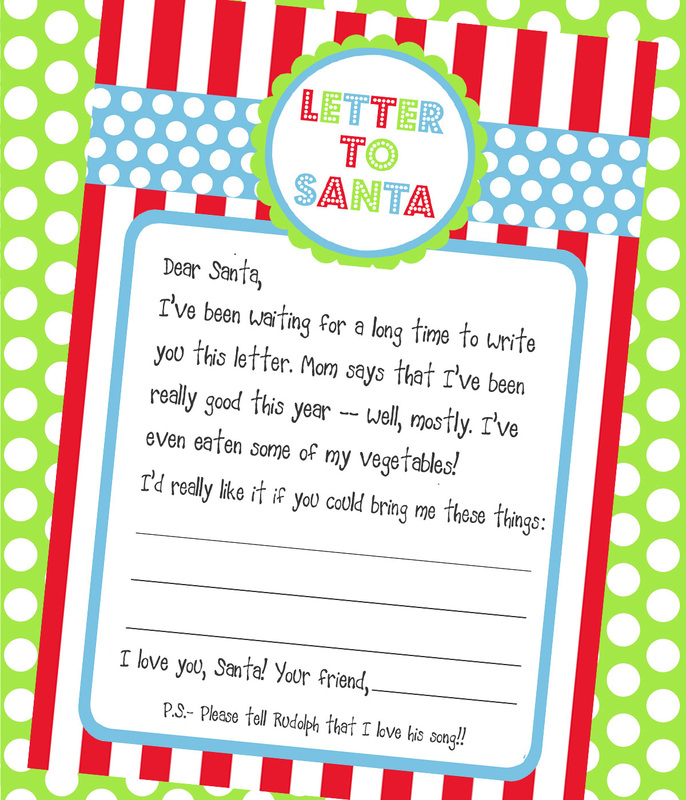 Amanda's Parties To Go: Letter to Santa.... FREEBIE! The Christmas spirit is alive and well in our house this year. Decorations are going up, a little holiday music is in the air, and the advent calendar was a huge success! I surprised my kids with it yesterday morning... I hadn't mentioned it at all and didn't have it anywhere in sight. So it brought joy to my heart and a huge smile to my face when my little 5 year old boy came down the stairs yesterday screaming, "It's a MIRACLE! A Christmas Miracle!" You can't do any better than that. It kinda makes all those crazy hours making it last year knee-deep in felt and glue and ribbon worth it. Kinda like pregnancy. I digress. So back to Christmas and the whole Christmas spirit thing.... isn't it wonderful? Candy canes and hot chocolate, Christmas cartoons and favorite old movies, shopping and wrapping.... I love it all! So as happy as I am about the season, I thought I'd share a little FREEBIE with all of my Facebook Fans and blog Followers. How about a cute Letter to Santa with a sweet address label to the North Pole? And I'm throwing in a sweet note to Santa, too, for Christmas Eve -- you can put it right beside his cookies and milk. The only thing I ask before you download is that you become a FAN of Amanda's Parties TO GO on Facebook (just click the "Like" button) and a Follower on my blog (look on the left sidebar and click "Follow"). That way you can find out about other Freebies and special deals I'll be offering. 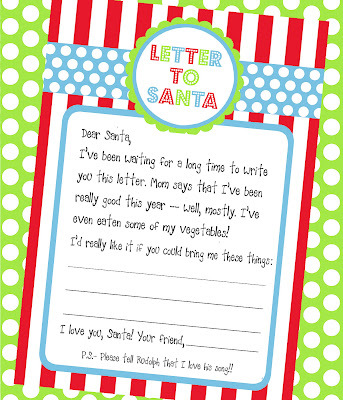 Want to take a peak at the Letter to Santa?? After you save the file to your computer, you can just print it, then cut it out and let the kids fill in their wishes. You can cut out the address label and glue it to the front of an envelope or you can print it onto sticker paper (mailing label paper) and apply it to the envelope that way. I hope you enjoy it -- my kids were begging to fill theirs out last night and get it straight to the mailbox. Maybe with this economy they're a little worried and think they might better ask Santa early this year! I love this!! My son is only 6 months old but I will be saving this for him for next year!! That is so so cute! I don't have children, but will save this idea for when I do! So fun! I'm featuring this on my blog. That's just darling. My children would love this. thank you. Hi there! What a great printable. I’d love for your to link up to my Tot Tuesdays linky party. Its every Tuesday and a chance to link up crafts, activities, tips, recipes and educational resources for all things TODDLER related. I hope you’ll stop by. Have a great day! This is a great printable. I am featuring this at somedaycrafts.blogspot.com. My Grands received theirs this past Wednesday, the phone call was great, all that joy and wonder. Great post ! ! I absolutely love love your stuff!!! May I feature your parties/freebies on my website?